It was a prize on Wheel of Fortune. It was where people came up every year for a few days or a week to get a taste of country life. It was where friendships and even families were formed. It was where people met and rode a horse for the first time and fell in love with it for the rest of their life. It was Roseland. Roseland Ranch Resort. It was… because they tore it down. Up until a few years ago I would drive by and see people splashing in the pool right by the road or going off on a trail ride or skiing, but it was only after Roseland closed and I started Pine Plains Views that I became aware of how much of a following this place off Hunns Lake Road in nearby Stanfordville had. People would write to ask what was going to happen to the property as if I had any information that it was going to reopen. They had a Face Book page and a discussion board on Topix with thousands of messages. After I posted new still pictures there would be a flurry of visitors to PIne Plains Views. 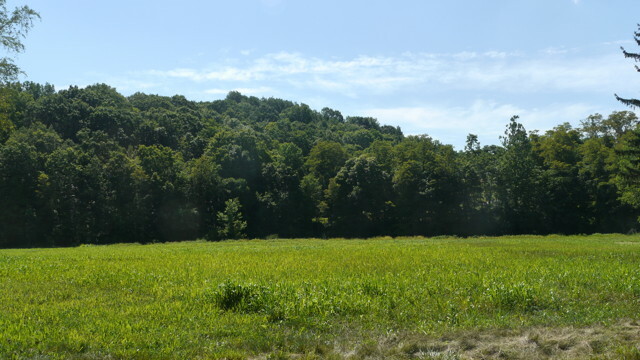 Every day there would be at least one or two visitors to Pine Plains Views to look at Roseland and leave the site without looking at anything else. It was odd. So, last week when I heard that the cranes and bull dozers had arrived, I went there and finally shot that first video. Here is where my story started back in 2008. I was driving by Roseland and I saw this sign. Pine Plains was in an area of summer camps and bungalow communities where people from the City came to get a taste of “country”. 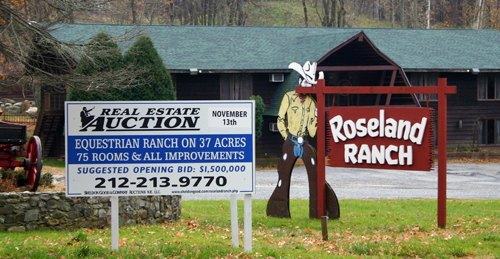 It was also the home of the dude ranch, Roseland Ranch, recently closed and now up for sale and development. It still attracts its own very lively discussion forum on the Internet of people who visited and worked there over several decades. At the moment there are over 3,500 posts! Update: As of November 17, 2008. I have not been able to get the results of the auction. I don’t think anything happened. Not all that much has changed. The auction sign was taken down. The ranch sign fell, or was taken, half-way down. It looks so empty. I never knew much about Roseland, but when we drove by there was always activity and people looked as if they came up to have a good time and succeeded. Horses are a major part of my life and I enjoy seeing people introduced to riding and learning to care for horses. So many people have visited this website just to find out more about Roseland Ranch that I decided to take a little drive this afternoon and shoot some Fall pictures. 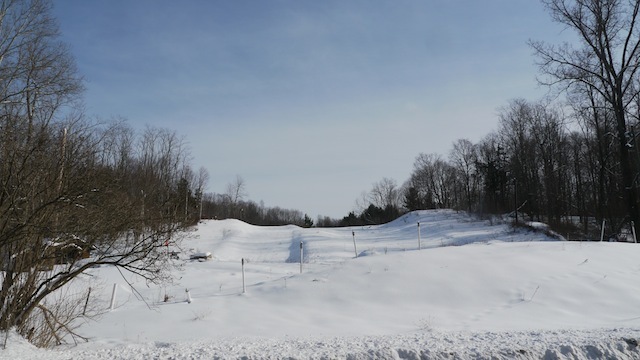 After the snow, it’s beautiful but there are no human or horse tracks in the fresh snow…. Did the cowboy have a name? The Cowboy Does Not Look Pleased! 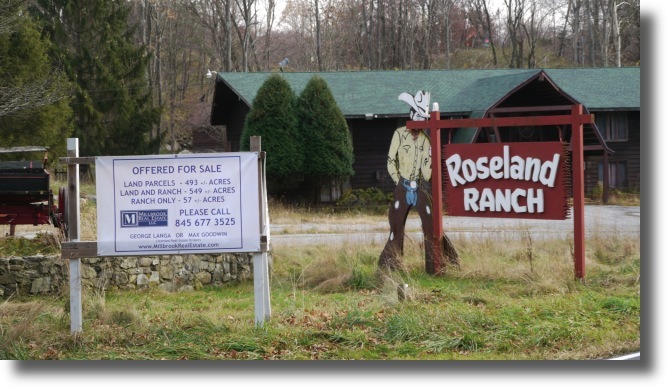 I wish I had more to show and tell the people who have come to Pine Plains Views looking for good news about Roseland. All I can offer them is a warm invitation to explore the rest of the website! I don’t think Roseland could ever be replaced, but dude ranches still thriving and it may be worth taking a look at DudeRanch.com. 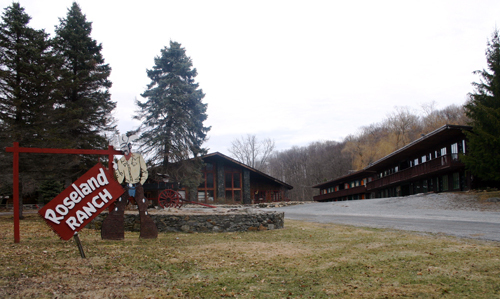 Pine Plains was in an area full of camps and resorts. Right in Pine Plains itself, where the Lions Club is now located, was Camp Stissing Lake. I just discovered that there is an active page on Facebook for Camp Stissing Lake. The site of the camp is like now the public beach where they start the Stissing Sprint Triathalon. 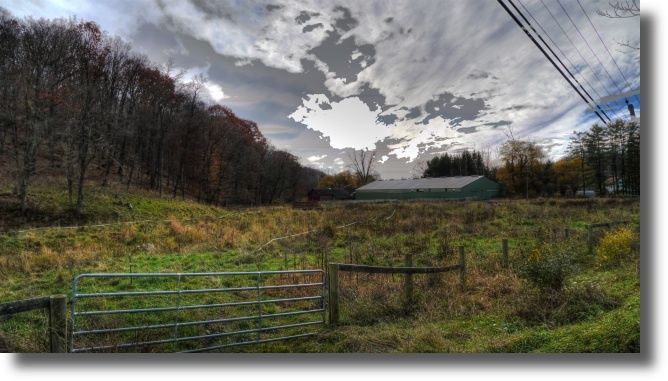 Take a virtual tour of Pine Plains on Pine Plains Views. In the surrounding area are the remains of dozens of summer camps and some are still in business. I hope to bring some stories about them into this website because they were an important part of the history and culture of the community. And who knows? They may become part of its future. I was very young so not a lot of memories but I remember the pool with the big diving board and also happy jack the musician. We went in the 80s, maybe early 90s. I was born in 82 and I think we stopped when I was about 7. My dad brought up the ranch earlier, when we were talking about family vacations when we were young, and I asked if I remembered. I said I’m pretty sure they closed (I remember reading a few years back) but was hoping it got brought out. Such sad news, truly a great place! I was one of the Wranglers there in the 70s, when I was a teen, great times. 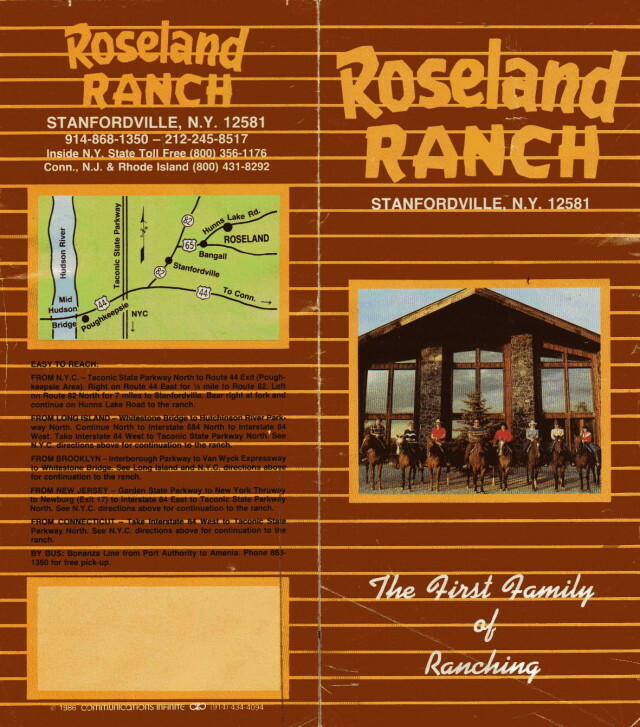 Was reminiscing about vacations of yesteryear, and was curious about the old Roseland Ranch. Sad to see it gone. The first time I ever rode a snowmobile or went skiing was there. Permanently burned into memory. If it’s any consolation, you share those memories with lots of other people. But now you see what became of it. Thanks for visiting and commenting. Parents knew Rose and Joe and came when the rooms were still in the main house and the cows would be grazing right outside our bedroom window. We all saw many changes but enjoyed everything and kept coming every summer. We went out on the breakfast trail rides early in the morning and did square-danceing later on in the evening. I later started coming with my husband and step children and still had a blast. Will never forget the great memories made and what great people Sonny and Chickie were. thanks for all the great memories. The family of John J.O’Connor. Loved Going to the Ranch with my Family !! Loved hearing Chickie sing and Dom’s cooking let’s just say the food was Great!! Liked helping out too! Memories I will NEVER forget!! Loved that place had so…much fun!! Remember Papa Joe & Mama Rose too!! One of my Best times in my Life!!! My Family (Davenports) Loved going there!! We Loved you Guys!!! Broke my Heart for it to be no longer by the original Family ! No one else could run that Place like you guys did!! Ah, what memories you invoke, Jackie. Your photos of a silent, bucolic Roseland Ranch are at a once beautiful and wistful. For my sister Jackie and me, heading up to Roseland on weekends in 1957 were magical interludes away from New York streets. Old-time goers to Roseland will remember Roseland for the great nightly Italian cuisine prepared by Fischera family cooks. And how they could cook! Non stop. On Saturday nights, we enjoyed the country music and square dancing by the Triple A Ranch Gang, “Bud” and Carolyn McGuinness; “Curly”; and Perry. And we enjoyed the slow rides up along Roseland’s trails, which at some point we learned with wide-eyed surprise, bordered James Cagney’s property, a horse lover himself. Yes, the “Cowboy” had a name. And we miss him dearly. Thank you very much for contributing to the history and memories of Roseland Ranch! Wonderful story about Stew as The Cowboy. I hope that more folks will contribute to this. I am amazed at how many visits to my website, Pine Plains Views, the Roseland story still generates. My mom worked at that ranch many years ago. Way before I was thought of, I heard stories about everyone there and how well she loved it out there. Wish I could have had a tipnout to see what it was like. 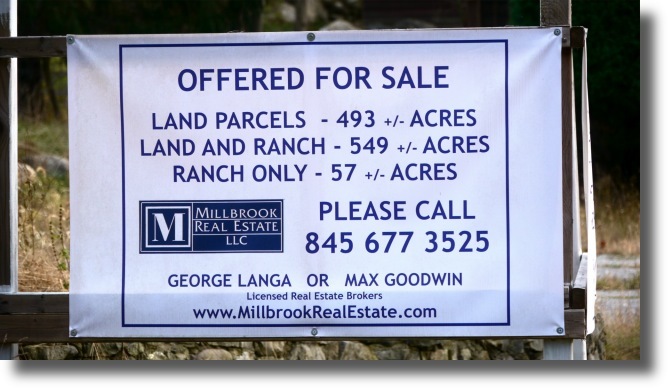 Thanks for commenting on Roseland Ranch! So many people have expressed life-long attachments to Roseland that I wish I could have preserved it on video in its prime. Hi everyone , I’m Chickie’s daughter and I want to thank everyone for writing such beautiful stories about the Ranch . I’ll be sure to tell my mother , she’s doing well , not working so hard as I’m sure many of you know how hard she worked at the Ranch . Roseland will live forever in our hearts and our memories !! Love the Fichera- Rando Family!! Thanks for the comment. I’m glad I preserve what I could of what had been a significant contribution to so many lives. Hi Maria & Bobby, Talked to Bobby a year or so ago. Miss all of you so very much. Your stories , the animals , the people , the food ,the entertainment, especially Chickies singing. Being in the kitchen, or the back pantry. Wherever any of you were. That was why we kept coming back, well that and the magic . Great to hear – please tell her Francine king says hi, we used to come every year day after Christmas for 15 years. I’m her nephew Wayne. Thanks for sharing these memories! Yes, it’s a shame that it has closed and that there is hardly any trace at all left. I am grateful that you visited this site and commented. We drove from New Hampshire in the late 80’s…with 3 kids in the old station wagon. Amazed at the beauty of Duchess County. Loved our time at Roseland, memories that we all still talk and laugh about. Everyone remembers something different from watching the deer, family style dining, bouncing on the beds and Dad’s saddle sores. Thanks for the comment. It’s gratifying but sad to see such lasting and memories of Roseland. Every time I drive by the site — now barren — I hear that song in my head. That video just brought tears to my eyes. My best childhood memories are from Roseland Ranch. I still remember Ray who worked in the stable and Chickie, the first owner. I still pray that this ranch will one day re open. It was at this ranch that I learned to ski, snowboard, ride horses, ride ATVs, play paintball, and much more. I also made some great friends there. Roseland ranch will forever be in my heart!!!!! 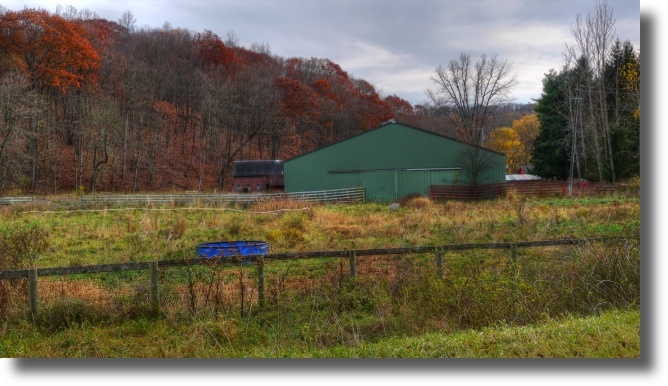 I fell in love with the Dutchess/Columbia County area thanks to going to Roseland Ranch many times from adolescence into adulthood. Have many wonderful memories of being there with extended family and friends. Ended up moving to the area around 1981 and raised a family. Was certainly sad to see it go. Thanks for the providing this forum for Pine Plains and “The Ranch”. And thanks to my daughter for finding it! My husband and I loved going to the Ranch when we were first dating . I remember being woke up in the early am for the breakfast ride, after a long night of dancing and drinking … lol , and they didn’t stop bagging on your door until you answered … lol After having children we always said we wanted to take them to Roseland Ranch… to build on our wonderful memories, however never got the chance since they closed in 2008. It is so sad to see these photos … and remember the once beautiful landscape we rode through. Thank you to the family owned operation .. for the memories you have created for those who visited the Roseland Ranch. Yes, very sad! It’s amazing how many people had such great memories. Thanks for commenting. My wife and 2 kids and My friends family also with 2 boys, went to Roseland Ranch for a week. We had a great time. Lot’s of laughs and good fun. My wife and her friend Marianne, entered a Bocce tournament, the two of them against some serious Bocce enthusiasts( older Italian gentlemen) . It was a riot, as the two women beat their butts. To see the faces and hear the comments of these elderly gents was hilarious. My kids are all grown up, with famalies of their own, my wife of 43 years has passed away but I have some great memories including our times at Roseland Ranch. I worked there in the early 70’s and it was something that you just never forget. I always wanted to find the time to go back and see Chicky but it just never happened. I used to put her eye make-up on for the dance at night – we had some good times. She used to make us clean the garbage cans with Brillo!!! Chicky used to sing and had a beautiful voice but as I read through the comments I see that Papa John and Rose also used to sing. I didn’t know that. Would really love to know how everyone is doing. If anyone knows the Sal, Alan and Joey trio it would be fun to hear an update. Truly a great place lost to the world. My whole family would spend vacations here and my dad would love the fact that “Jimmy Cagney” lives just up the road. I will never forget the fun we all had here and Sonny yelling at us at the breakfast table to go take a morning ride. Nor will I forget all those homemade muffins and coffee waiting for us when we got there to check in. This video is heartbreaking. It is too bad no one was able to buy it and have it live on. Too bad there is no Facebook page where we could post pictures. God bless the Roseland Ranch! So very sad to hear of this demolition. Another place of my youth destroyed. The Ranch memories remain with me always, and for that I am eternally grateful. You took a troubled kid off the streets and made something out of him. You should be proud. I once worked this Ranch back in the late 60’s. I was hoping to return there some day as a guest. I will never forget my time there. I learned for the first time, just what hard work really was, and from that experience,I grew, and it turned my whole life around. I remember that first day vividly. Papa Joe picked me up in Manhattan with his Station Wagon and drove over 100 miles non stop to the Ranch. He smoked Crooks rum soaked cigars all the way and I’ll never forget that smell! He asked if I knew anything about horses. Being 16, young and stupid, I lied to him, and told him I knew everything about horses. Told him I used to work with my Grandpa, who was a groom at Central Park stables. He looked at me with one eyebrow raised and said nothing more the rest of the way. The truth was that the only horse I ever seen or rode was at a kiddie pony ride on the upper East side, and the old Westerns on TV. We arrived at the Ranch and I was introduced to the Family. Papa Joe took me to the barn to meet the Wranglers. Then he took me inside the barn and told me to take care of his horse. He went outside, and I entered the stall with this enormous stallion. I thought that the bridle and bit looked uncomfortable, so I too it off first. The horse then started to back out of the stall because I failed to reconnect the stall chain. Now I’m chasing the horse out into the coral. The Wranglers were quite amused by all this as Papa Joe says to the laughing men, “He knows all about horses!…son…if my horse don’t eat…you don’t eat!” Lesson learned…I never lied to him again. It took me a while to coral that big stallion, but I did it,much to the amusement of the Wranglers who had never seen anything like it! Early next morning, the job started. Sonny told me what to do and I did it.He was a big man so when he spoke, I listened. I once saw him wrestle a sick horse to the ground, so he could administer meds to a infected eye with a coffee pot. I once loaded the barn with hay with him and he could pick up a bale with one hand! He was a hard worker and he expected everyone to do his share. Here’s how a typical day went… He would bring the horses down with a yell and we saddled up the morning ride. Once that was done we served Breakfast,cleaned up the dishes and took out the morning ride. Then we served Lunch and took out the afternoon ride. Dinner was next and then the evening ride. After all that we had to wash up and entertain the guests with square dancing. Totally exhausted,it felt like I just hit the bunk bed when sunrise came and it started all over again. I’ll never forget what I learned there from Papa Joe, Dom, Chickie, Sonny and the Wranglers, and sweet Mama Rose, who was always very kind to me. I learned all about hard work and dedication to the job. I took the lessons I learned there with me and they served me well in my life. I saved a kid from drowning one time, so I was made the Lifeguard. No running was allowed in the pool area and I once made all the kids sit it out for running. Pool empty and quiet, Papa Joe came in to see why it got so quiet. He gave them all a reprieve and in the pool they all jumped. This Ranch and Family will live in my heart till the day I die…Thanks folks…you saved this kid’s life too. Roseland lives in my Heart. I was so sad to here that the ranch had been closed and now demolished. I had an awsome experiencde there myself. I, and two other boys were members in a little band called the Variations. We played at the ranch for quite some time in the late 60’s every Saturday night. I can still remember Mamma and Pop Rose coming up to the bandstand and entertaining in their somewhat comical way. (Mamma would say “Give this man a hand …right across the mouth!!! !” and the people would laugh.) Then they would sing, and they had some beautiful voices, as we backed them up musically. I remember the food that was brought out and we were privilaged to join in and eat with the guests. The barbecued spare ribs were heavenly. I had some of my best times playing the drums and watching the people dance to our music. We played mostly standards with accordian, guitar, and drums and some rock and roll when the accordian player picked his guitar and sang. It was and experience that will last in my memory forever. 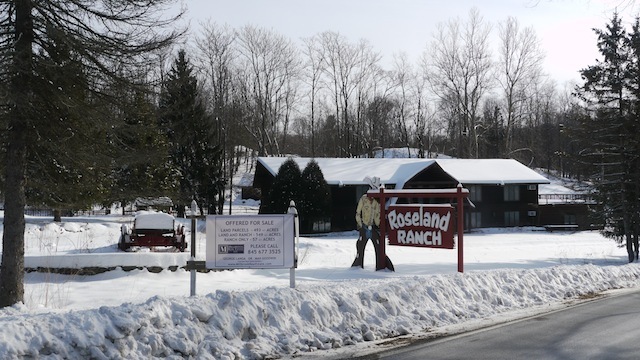 I am 64 years old and still talk about our trips each weekend from Connecticut to New York to play at the Roseland Dude Ranch. It will be missed. Tears as I watch this video. All the best memories of me and my family came from years and years of going to Roseland Ranch. The one true Dud Ranch, that so many compete to be like, but does not come close. This was my 2nd home and will remember it always. My family and I won a 4 night stay there in 2007. We were one of the last families to spend time there. We are from California and rode Amtrak from GCS in NY. They had new owners by then and although the new owners weren’t very friendly, some of the old timers (caring for the horses) were terrific! We were actually the only family at the entire place that weekend. I could tell it was going downhill. The utility company came while we were there and was prepared to turn off the power. They made a small payment to delay that but again, I knew something was wrong. Even still we had a great time riding horses, RV’s and eating large yummy meals. The fried chicken was awesome! It was the first time my son got into a swimming pool was at their indoor one that weekend. My kids shot a 22, bow and arrow went hiking and had a wonderful time. When I returned home I was captivated by the place and followed the sale, the love people expressed for having the chance to visit regularly, the attempts to save it and now, sadly the destruction of it. Indeed, I cried when I watched the place being destroyed, and I have only been there once. The music with the video made it even harder to watch. The fact is it was in a great location, and if run well, should have been a money maker. It I’d won the lottery, I would have invested in it. I am truly sad for the loss that I see everyone feels whom have been touched by such a special place. I went there as a guest back in the late 70’s when I was in my teens. Had a great time. We went there in the summer and there was tons of guests. The place was hopping. I rememmber they fed you like you were on death row. Remember a heavyset guy names Sonny who seemed to be in charge. 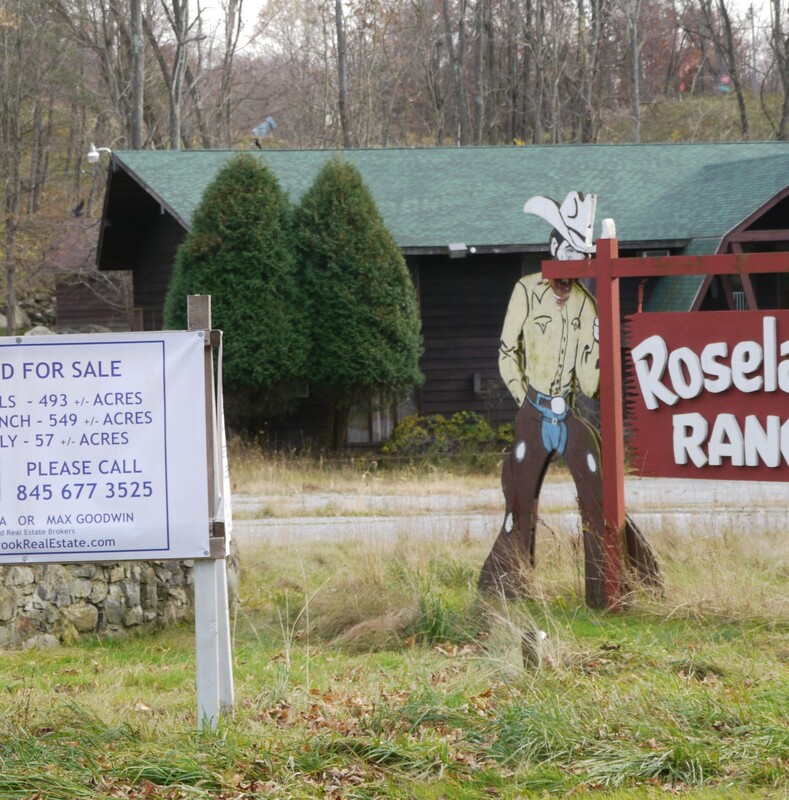 I went to another ranch named Roundup in Downsville, NY. It met the same fate. Unfortunately, with airfare much easier these days, these type of resorts are slowly biting the dust. Very sad. The video of them razing the guest houses and pictures of the place in disrepair are extremely depressing. Thanks for sharing them. Soon after the Ranch closed, Sonny had an E-maill address and was writing about how upset he was that the ranch had been closed. It was only later I found the site and wrote to him but never got a reply as I think it was closed. Would have liked to have made contact as he might know the whereabouts of some the people I worked with back in the late 50’s and ’60’s. I do know of three of the people from that time. Back when I was working there most the Guest were single ladies who didn’t want to do the “Bars” to meet guys! On the big three day weekends, we Wanglers were asked to invite some of our male friends so there would be a better balance of male to female. A lot of my buddies got married and I came close. In the winter, every year they would have a big Ball in NYC and it was like the gathering of of a super large family! In the Spring of 1961, I got recalled to the Air Force and never returned to live in the East; but even now, 51 years later, I smile with the memories of Roseland and the people. Spent the fall of 1987 at the ranch. My wife and I have great memories because we arrived in a big snowstorm and were put up for the night. No electricity and were closed and had gas. So dinner was all the steaks we could eat and icecream before it melted. Left the next day (Sunday) and came back the following Sat. They had put up the electrical crew from all over so they were the first one’s to have power. We spent most of our time with Sonny. Where did he go after the sale? Worked at Roseland in late 50’s and early 60’s with my friend Al. Had some super times and made life long friends. Had a sweetheart of a horse to wrangle with. Lots and lots of people got married as a result of meeting there! It was like family! Sure getting to be a lifetime ago! In some ways I wish I hadn’t looked up the Ranch as in my mind and heart the place was still going on as I remember it. Thank you for informing all of the people of this sad news. Roseland will missed by so many. It was place were visitors went for serenity and fun. Of all places on earth, I think it was the closest to heaven. As guests, that returned there often, and; hoped with all thier hearts that the ranch would be reopened, we truly appreciate knowing the facts instead of wondering when we could vacation there again. To Chickie and family, we will never forget the great times we shared at your home and all the memories we made. We love you guys! And of course, Indian, Coda, Winchester, Nsync, Foggy, Whiskey, Colorado and Bonaza, we miss you too! Big card games with lots of money on the table on one of the February Holiday weekends. The Chinese Buffet at night with lots of ribs and fried rice. The platter-sized pieces of veal for Saturday lunch. Huge breakfast buffets with every breakfast food there is. Family shows on Saturday night, then family dancing (wedding music), then adult dancing, then rock music for the teens at midnight. At least five meals a day with huge snack trays in the lodge between meals. The massive fireplace and tree-length logs that were always burning in it in the main lodge. The over-stuffet chairs, couches and lounges in the main lodge. Snowmobiling over miles of trails through open terrain. Most of the staff being family members. Horseback riding, skiing, hiking, relaxing by the pool. Spacious rooms and great service. At least five meals a day. Did I mention at least five meals a day with 24 hour snacks and drinks. What did they do with the Roseland Ranch sign? I’m disturbed by the images of machines haphazardly demolishing TONS worth of abandoned buildings rather than SOME of it being repurposed! I’m sure somebody (Peter Wing comes to mind) would have LOVED some of this! Spent years there every fall with many friends and family Our kids grew up looking forward to our chilly morning rides. It is sad to see this, but a sign of the changes in the simplicity of the world. Hey get your facts straight , the ranch is I. Stanfordville, ny. It is to bad that it had to come to this. Back in the day the ranch had hundreds of guests a week, it also bought lots of money to the town of Stanford.